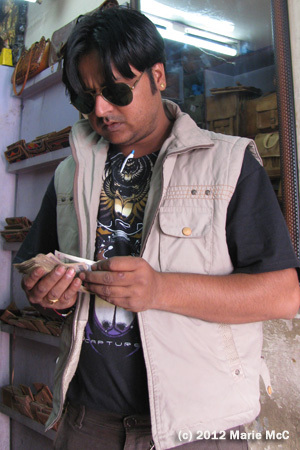 My last full day in Udaipur had come all too soon. 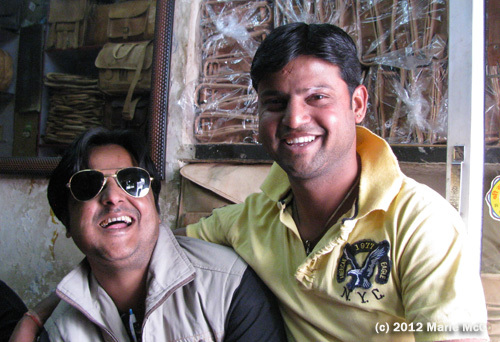 I spent a good part of the day at Nirmal’s shop with him and Pushker, watching Nirmal do business with a parade of people who came and went. Several people also stopped in to say goodbye and wish me a safe journey home. Suddenly some loud music brought us to our feet to curiously peer out the shop door, wondering what was happening outside. 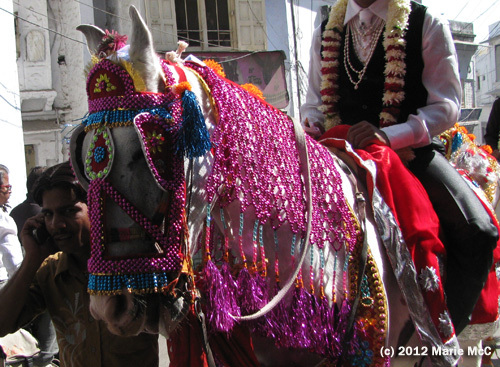 It was a wedding procession. 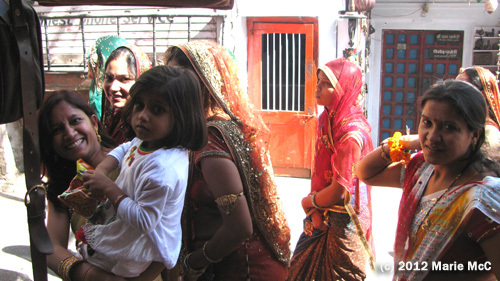 Life in Udaipur is a never ending parade. There’s always something interesting going on. You can have a good time just hanging out with your friends. That’s all I did that day. After dinner we had one last get together at the rooftop restaurant at the Island Tower Hotel. 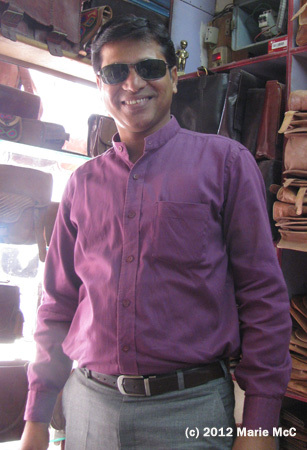 The following day I was to fly back to Delhi, stay overnight then return to DC. Woke up feeling sick. Soon after getting up, I was throwing up and having diarrhea. You travel, and — sooner or later — it happens. I couldn’t reach Nirmal, who was going to take me to the airport, but the guy at the Mewar Haveli front desk came to my rescue. He asked for my symptoms and very kindly went to a nearby pharmacy and got me some medicine. The cashier from the bookstore annex explained each medication in detail, what they were and how often to take them. 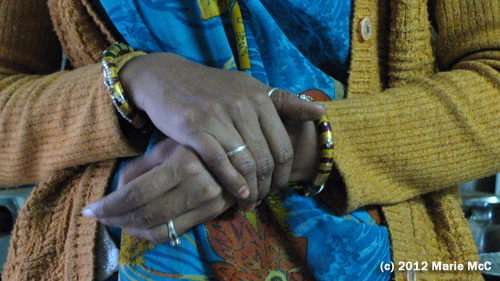 Getting sick while traveling alone in India is no cause for panic. Someone will help you. India is like that. I was glad to have a full day in Delhi to recover before flying home, even though I spent most of it in bed in the hotel. 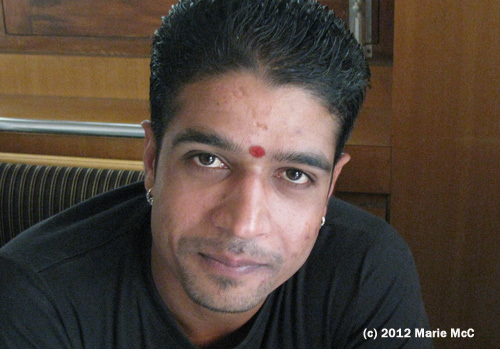 Now that I’m back in the states, I miss India and my Indian friends very much. But, like Arnold, I’ll be back. 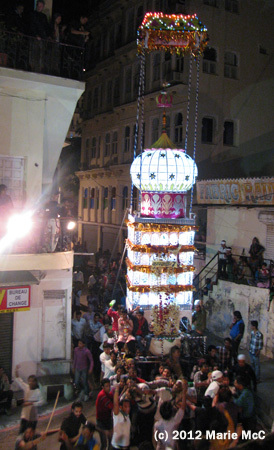 The Muharram Festival took place in Udaipur on November 26. 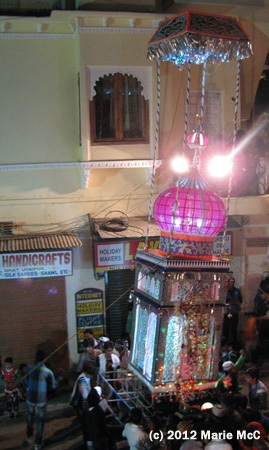 A group of us went to a rooftop restaurant near the Mewar Haveli Hotel which was at the end of the parade route. We planned to hang out there so we’d have a great spot to view the activities when the time came. 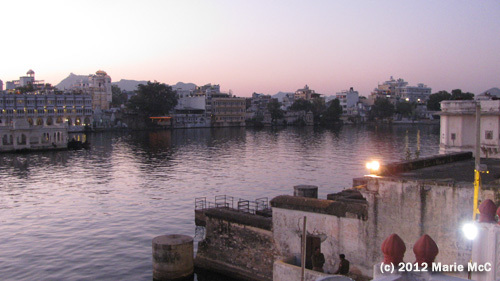 We ordered a round of drinks and watched the first show, the Udaipur sunset. 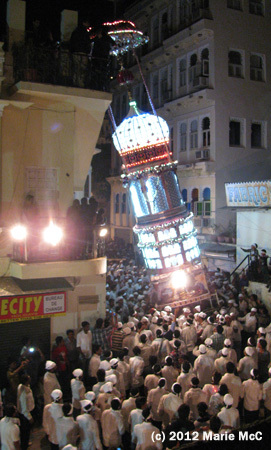 These floats, called taziyas, are carried through the streets. 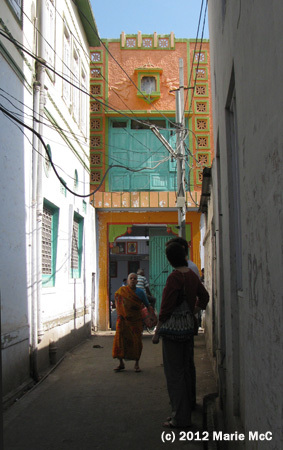 In the historic section of Udaipur, the streets are not only narrow, they are hilly. 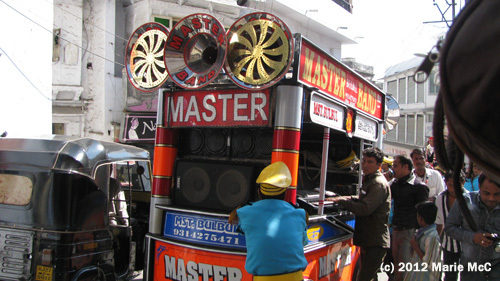 Carrying the tall taziyas through hilly streets causes swaying at best. Ropes are tied to them to help keep their balance. Despite the best efforts of the team carrying them, sometimes the taziyas topple into nearby buildings. 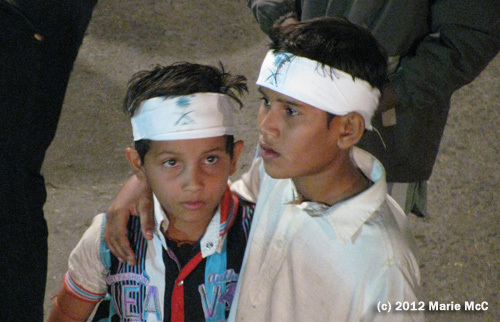 Muharram is a Muslim festival. There were no women in the procession. 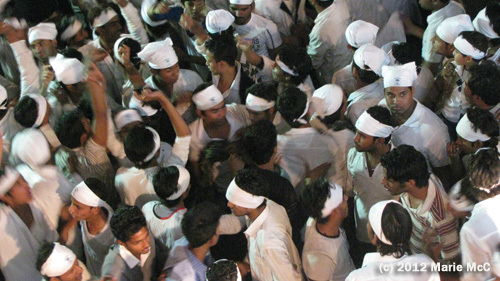 The festival is connected with the death of the prophet’s grandson. 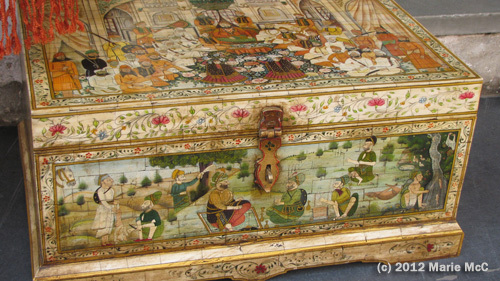 There are many websites which offer detailed explanations of what the festival is about. Rather than paraphrase them here, if you’d like to know more about it, follow the link in the first paragraph. Pushker had invited me and a Belgian couple, Tiffanie and Simon, who had also attended the wedding, to lunch at his home. Pushker’s family rents several rooms in old Udaipur where some of the streets were so narrow that the tuk tuk couldn’t drive us all the way there. We followed him on foot for several blocks. We rounded a corner and came upon an open area that looked like a miniature city square. 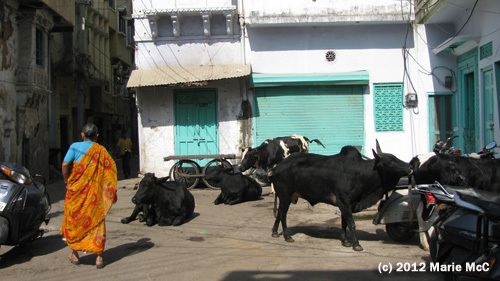 There were eight or nine cows in the area and a row of motorcycles parked on the right. A couple of bulls took issue with each other and started jabbing each other with their long horns, knocking over several motorcycles in the process and threatening to knock down the rest like a group of dominoes. A man nearby shouted at the two bulls and distracted them. 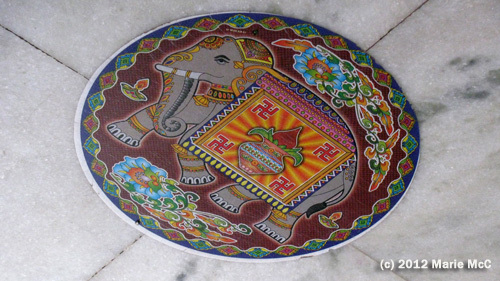 Cows may be sacred to Indians, but that doesn’t mean they’re never annoyed with them. The cows can be a nuisance at times. Pushker’s family is large, and they share several rented rooms. 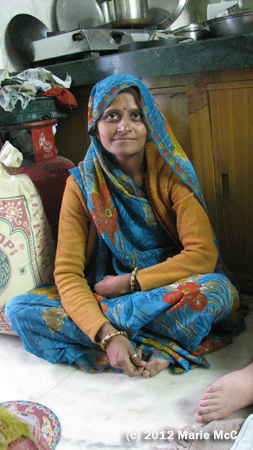 There was no living room or dining room, so we were seated in the tiny, narrow kitchen. Actually, Tiffanie and Simon sat on the floor, and I was given the only chair. 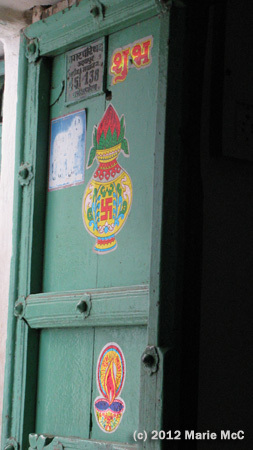 Both the kitchen door and the floor had colorful religious decals affixed to them. 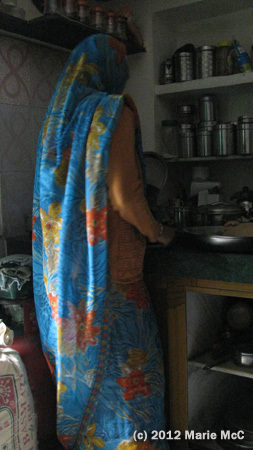 We watched as Pushker’s sister-in-law finished preparing the meal. We were served egg curry and gulab jamun, the best I’ve ever had. We were introduced to Pushker’s sister-in-law, but he didn’t actually tell us her name. Hmm, there seems to be a pattern here… She didn’t speak much English, so unfortunately we were unable to get to know her. 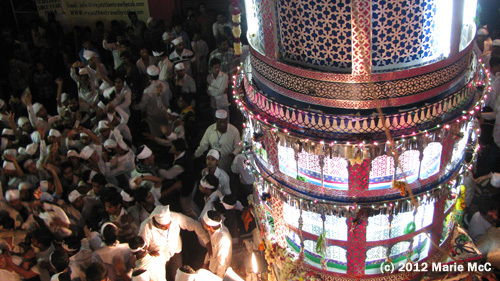 There was a Muslim festival going on this day (November 26) with a major procession taking place in the evening. After thanking Pushker’s sister-in-law for the delicious lunch, we headed to the Lal Ghat area where the Mewar Haveli Hotel is. We intended to watch the procession from a rooftop restaurant nearby, and we needed to get there early to stake out a table. 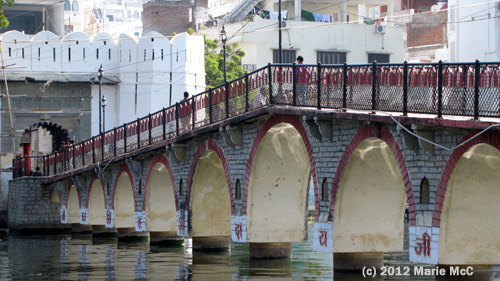 Most of the photos of Udaipur you’ll see in an online image search will be of the City Palace and the heritage buildings on the lakefront, which are stunningly beautiful. 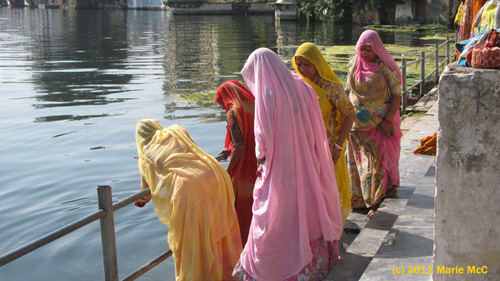 But there’s so much more that is beautiful in Udaipur. The bridge to the Hanuman Ghat area. 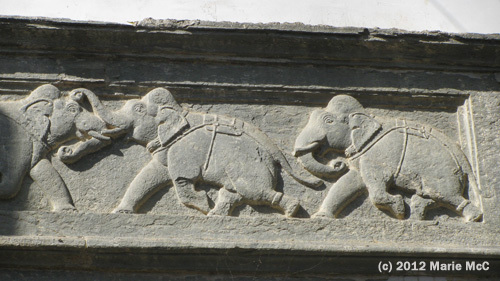 Detail over a triple arch gateway leading to the ghats. The fabulous things for sale. 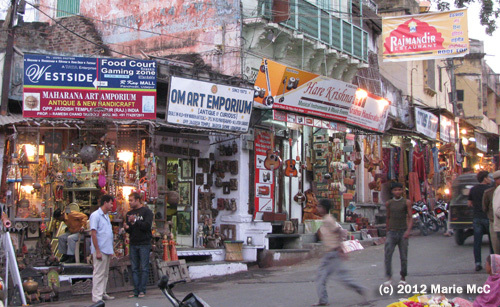 The vibrant streets in the heart of old Udaipur. The attractive and interesting people, who are not in short supply.